A Community activist has lashed out at those who struck twice in as many nights and stole historical signs as well as attempting to steal a parish pump from a North Galway heritage park. “They strike like thieves in the night, bringing cutting equipment with them and while it can take 40 to 50 years to build up a heritage park these people can destroy so much of it in an hour or two”, says Frank Glynn of Milltown Community Council. In their initial raid on the park in Co. Galway’s tidiest village, the thieves stole a valuable early 1950’s cast sign of Milltown erected for the famous An Tóstal festival of that era which the local committee say could cost up to €1,000 if it had to be cast today. But while the searching for that was going on, the raiders struck again within 48 hours and stole three other historic signs, having also attempted to remove the restored parish pump. “However we will now have to re-bolt it to the ground and put concrete all around the area where the bolts are,” said Frank. He believes that the thieves are local with a knowledge of what was in the park and their sole aim must be to sell the historic signs. “They don’t care about religion either, as one of the signs they stole was for Knock which had been erected in the village prior to World War II to show people the route to the shrine. 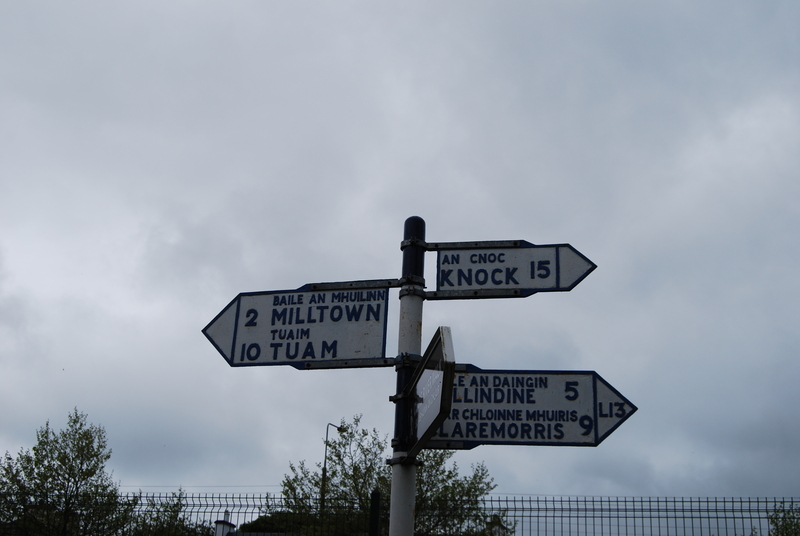 “Many of those directional signs were taken down by the DeValera government of that time so that any Germans who landed here would not know where they were going. But these thieves knew where they were when they hit our park,” said an irate Frank. He added that the Gardaí in Dunmore were informed of the thefts and the Milltown Community Council also put photographs of them on their website which attracted over 2,000 hits – but so far no sign of the signs. After the theft of the first sign was highlighted in The Tuam Herald, and on our website, thousands also saw the story and many people phoned members of the Milltown committee. “The brazenness of it all is that those thieves struck at our heritage park twice within a matter of nights and as we feel that they did not come from far away, but want to sell our signs to pubs or hotels far away, we are again appealing to anyone with any information to come forward so they can be caught,” concluded Frank. This page was added on 03/12/2015.